RIO DE JANEIRO, BRAZIL – Once seen as the sporting choice of the quintessential English gentleman, cricket has returned to Rio with the Carioca Cricket Club, which is looking to reinvigorate a piece of English heritage in the Cidade Maravilhosa. Now, on Sunday, December 4th, the club, along with the UK Consulate in Rio de Janeiro, will be hosting a “cricket day” at the old home of Rio cricket in the Ingá neighborhood of Niterói. 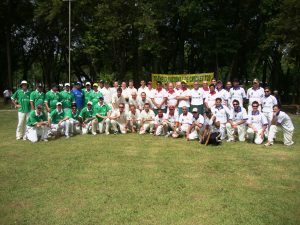 The four sides who competed in the T20 tournament, from l-r: Parana, Rio, São Paulo, and Brasília, photo by Carioca Cricket Club. Alexandra Morris, of the UK Consulate, explained the importance of reaching out to the British community here in Rio. “With the Olympic Games [in London] next year, we wanted to do something sports related at Christmas, as well as promoting British culture,” she said. The event started with the goal of reviving the infamous but at times friendly rivalry between Brazil’s two most famous cities, Rio and São Paulo. However, such has been the level of interest in the project that two Rio sides have already been confirmed for a Twenty20 rules match. Cricket has existed in Rio since the mid-1800s, when a substantial part of the city’s population was of British descent. Emperor Dom Pedro II opened Rio’s first official cricket pitch in 1860 on Rua Paysandu in Laranjeiras. Now the goal is to once again make cricket a major pastime in Rio and Carioca Cricket Club is well on its way to being a success, not just across the state but nationwide. Two weeks ago, the side competed in a national Twenty20 competition in Curitiba. 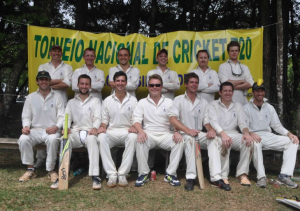 The 2011 Curitiba T20 squad, photo by Carioca Cricket Club. Despite having only had a couple of training sessions together prior to the championships, the club did the state proud, finishing as runner-up. Star all-rounder James Lomas attributes the side’s successful showing to the strong sense of team spirit running through the side. “Strengths [of the team] are that everybody has played a bit in the past. It’s just a case of remembering what to do as we’ve not played for ages. We are mega keen, we’re all good mates…which helped the team spirit in Curitiba,” Lomas said. With backing from the ICC (International Cricket Council), cricket in Rio de Janeiro is very much on an upward curve, and as a result the club is constantly on the lookout for fresh talent to join the ranks. Since Brazil’s entry into the ICC, junior development programs have been established in São Paulo, Brasília and Curitiba, with the hope Rio is next on the agenda. Anyone interested in joining can send an email to cariocacricket@gmail.com or check out the club’s Facebook page for more details. Alternatively, there will be plenty of people to discuss cricket with at the Carioca cricket day itself on December 4th, with gates opening at noon. Rio Cricket Associação Atlética is on Rua Fagundes Varela and can be reached by the number 57 bus from Niterói city center.